Major pharmacological groups recognized as being ototoxic to humans include aminoglycosides, macrolides, glycopeptide antibiotics such as vancomycin, cytotoxic agents used in chemotherapy (i.e., cisplatin), loop diuretics, acetylsalicylic acid (ASA) and nonsteroidal anti-inflammatory drugs, topical antiseptics (i.e., chlorhexidine), alcohol, povidone iodine, neomycin, antimalarials (i.e., quinine, chloroquine), iron chelating agents (i.e., deferoxamine), etc. Few other agents that are potentially ototoxic include propylene glycol (a common combination of ear drops), methyl mercury, povidone-iodine, potassium bromate, industrial solvents (styrene and toluene), chloramphenicol, ampicillin, propranolol, propylthiouracil, bleomycin, nitrogen mustard, carbon monoxide, tetanus antitoxin, gold, lead, arsenic, alcohol, nicotine, caffeine, and marijuana. Some of these compounds are more neurotoxic than ototoxic [Figure 1]. Aminoglycoside ototoxicity has been reviewed by Forge and Schacht and recently by Roland and Rutka. Aminoglycoside interferes with cell membrane lipids in two stages. First, once a cell is exposed to the antibiotic, reversible binding of the aminoglycoside to the plasma membrane occurs. Second, energy-dependent uptake of the antibiotic occurs. Once inside the cell, the aminoglycoside interferes with basic cellular processes and ultimately disrupts the cellular membrane. The molecular mechanism of this latter process includes inhibition of the phosphoinositide pathway, which in turn affects calcium influx, activity of adenosine 3',5'-cyclic monophosphate, cell membrane homeostasis, as well as many other basic cellular functions. Histologically, HC stereocilia become edematous after aminoglycoside exposure. In patients who harbor the mitochondrial 12S ribosomal RNA A1555G mutation, perhaps protein reproduction and turnover (i.e., recycling) cannot keep up with the rate of damage incurred within the stereocilia at certain antibiotic concentrations. Loss of HCs, type-l more than type-II, and vacuolization of the remaining HCs have been described in the cristae. HC loss and vacuolization have also been observed in the maculae of the utricle and saccule. Early Aminoglycoside effects manifested with neuromuscular and auditory blockage, are reversible, and attributed to calcium antagonism and channel blockade. The postsynaptic excitatory amino acid blockade has also been postulated. Quinine and chloroquine are known to cause tinnitus and typically reversible hearing loss. Cisplatin has been shown to induce apoptosis in the cochlear cell line, in a dose- and duration-dependent manner. Major risk factors for aminoglycoside-induced ototoxicity include a prolonged treatment course >14 days, elderly patient above the age of 65 years, the development of renal failure during treatment, elevated serum aminoglycoside levels (especially preadministration or trough levels), or concomitant use of other ototoxic agents (i.e., diuretics, erythromycin, ototoxic ear drops, etc. ), and/or a previous history of ototoxicity. It is obvious that potentially ototoxic drugs should be carefully monitored especially when used in the presence of any of the risk factors mentioned above. Aminoglycoside ototoxicity could be unilateral and reversible. Patients who developed measurable ototoxicity may be asymptomatic at the time of discovery. Gentamicin, previously thought to be primarily vestibulotoxic, also causes cochlear toxicity. Gentamicin, tobramycin, and amikacin toxicity are usually noticed after the course of treatment. The most common symptoms are tinnitus, reduced hearing sensitivity, and dizziness. Acute effects of aminoglycoside toxicity manifest with neuromuscular and auditory blockage. Evoked potential measures such as electrocochleography, auditory brainstem response, and auditory steady state response in selected cases. Clinical tests for vestibular function should be performed during drug administration, include the head shake test, the Halmagyi (high-frequency head thrust) maneuver, and the oscillopsia test (which addresses changes in the dynamic visual acuity during active head movement). Specific laboratory vestibular function tests such as electronystagmography, rotation chair testing, posturography, and vestibular evoked myogenic potential can also provide some quantitative information in clinically positive patients. Topical ear drops containing propylene glycol should be avoided which apart from being ototoxic may lead to aggravated mucous discharge in 40% individuals due to its sensitivity. The rapid administration of bolus doses of ototoxic drugs and concomitant administration of especially loop diuretics and aminoglycosides should be avoided. Once-daily dosing of aminoglycosides has shown promise to reduce toxicity. Furthermore, ototoxicity seems to be predicted most by the total dose rather than by serum peak and trough levels or any other associated factor. The suggestions are to adjust the dose of aminoglycosides according to creatinine clearance rather than serum levels. There may still be an important role of monitoring cochlear and vestibular functions because only a small number of patients develop symptoms at the time of treatment. The early development of symptoms with erythromycin, ASA, and quinine provides a useful warning in alert patients. Excluding hypersensitivity, irreversible ototoxicity generally occurs with these agents only when high doses are continued after the development of symptoms. On the appearance of symptoms, these agents should be withdrawn promptly. Total daily doses of erythromycin >4 g, or 1.5 g in the presence of renal impairment, should be used with caution. Because a uniform method of monitoring for all drugs is not reasonable or practical, the authors suggest that monitoring for ototoxicity should be individualized depending on the particular drug being employed. During monitoring of cochlear function, particular attention should be paid to pure-tone thresholds at 8 kHz and above because a decrease in sensitivity to high-frequency sounds is the most sensitive auditory change for most ototoxic agents. OAEs show promise as another method for monitoring. Vestibular tests should be considered in susceptible patients receiving aminoglycosides even for a week, as the earliest reported incidence of the ototoxicity was 5 days after initiating therapy. When a patient is referred for evaluation of possible ototoxicity, the audiologist-otorhinolaryngologist team should identify possible evidence of ototoxicity and make appropriate recommendations based on clinical findings and test results. In many cases, there are no alternatives to the ototoxic medication. It may be appropriate for the physician prescribing the ototoxic medication to renew the discussion of informed consent if the medication is to be continued. Alcohol in paints, adhesives in industry and computers, propane, kerosene, automotive diesel, and gasoline jet fuel (JP-8) which contains aromatic hydrocarbons, toluene, styrene, and ethyl benzene all lead to chemical toxicity mainly affecting the first row of outer HCs. Toluene is generated in huge quantity by auto emission resulting in air pollution. Toluene is also used in chemicals, paints, adhesives, rubber rotogravure printing, and leather tanning. Acrylonitrile (vinyl cyanide) is an important component of plastic, rubber, and textile industry. Chemicals toxicity is further potentiated by noise pollution or accelerates the hearing loss induced by other etiologies viz. Presbycusis and noise trauma, etc. Grapefruit juice can potentiate 10-250 times absorption of drugs into the blood stream including of anti-histamines, anti-depressant, and psychotropic drugs aggravating the deafness. The heavy metals, mercury, lead, arsenic, manganese (battery manufactures and electroplating organic solvents), carbon disulfide (solvent and insecticide), trichloroethylene (use as degreaser in dry cleaning, spot remover in paints), xylene paints, varnishes, and thinners are the potential chemicals leading to ototoxicity. Carbon monoxide, apart from poisoning and other symptoms, can aggravate deafness in potentially hearing impaired persons hence gas water heater, barbeque, oven, charcoal heater (Kangri in Kashmir), room heaters, and electric generators should be avoided in closed rooms. Cleaning your hands with turpentine or nail polish may lead to ototoxicity; drinking alcohol during work may aggravate toxicity. People may become addict to some solvents, as Tincher ethylene. Butyl or ethyl acetate transfluthrin used as insecticide/mosquito repellant must not be used with door and window closed and should never be used in airtight air-conditioned rooms due to the risk of chemical toxicity. Spray perfumes should be discouraged in potential patients. European Union prioritization list includes d-trans allethrin toxicity for endocrine disruptions in the perfumes which is similar to cigarette smoke leading to sensitization of respiratory mucosa, resulting in sinusitis, Eustachian tube More Details dysfunction, and deafness apart from asthma. along with other risk factors leading to sensorineural hearing loss. Materials safety data sheet should be available in the local language so the workers can understand and benefit from it. Bed should be away from electrical appliances and all electrical devices not in use should be turned off specifically in the night. Digital clock/alarm clock and heating pads should be avoided in potential sufferers. Wi-Fi should always be kept in auto switch off mode. Teenagers should be discouraged to use mobile phones and complete NO to music on mobile phones. Same is for pregnant women to avoid fetal malformations and impairment of hearing in the fetus. Encourage the use of land line (wired) phones. Remove metal from bed and chairs as metal attracts and magnify the EMF. Office and bedroom in potential cases may be made EMF free zone by installing radiant barrier aluminum foils. A significant permanent hearing loss would warrant hearing aid fitting if the affected person has difficulty in day to day functioning due to hearing loss. In adults, it might still be a matter of choice but in children, it is important to address even mild hearing loss due to its effects on speech and language development along with educational concerns which increase as the degree of hearing loss increases. In children, partial, asymmetrical, or sloping hearing loss may easily be missed by the parents if they are not vigilant for the signs of hearing loss. Sloping configurations (with thresholds at low frequencies better than those at high frequencies) are specially elusive because the relatively better thresholds in the low frequencies enable the child to hear and respond to many sounds and to understand simple spoken language specially from closer conversational distances. Parents may often report sloping hearing loss as "inconsistent responses" to sound. In cases where the hearing loss is severe to profound or very steeply sloping (profound in the high frequencies), the child or adult may not be able to get sufficient benefit even from high gain hearing aids. The option of a cochlear implant could then be considered. The old age hearing loss may be associated with shrinkage of superior, middle, and inferior temporal lobe gyri of brain, responsible for processing of sound and speech which may be a pointer of developing dementia. Males are 3 times more prone to noise-induced hearing loss hence to dementia. Only 20% senior citizens are satisfied with the use of hearing aid; hence, prevention is the only remedy by avoiding chemical toxins, ototoxic drugs, and alleviating or ameliorating the deafness and sensitizing the cerebral cortex. Change in lifestyle including restriction of mobile phone, modification of diet, eliminating Vitamin D deficiency, , and yoga , is the only remedy to prevent a worldwide disastrous epidemic which we have to face in the times to come. Audiologist/otolaryngologists and industrial health workers should keep in mind the synergistic effects of chemicals, drugs, noise, and presbycusis. Only pure tone audiogram is not conclusive in retrocochlear lesions because speech discrimination will be disproportionately poor in the majority. The common words S/F/T viz. see/fee/tea might be difficult to differentiate. Employees in trade of dry cleaning, plastics, printing, painting, photography, building, and chemical manufacturing are at multi-fold risk and should not work in airtight, air-conditioned rooms. Informed written consent should be taken whenever a potentially ototoxic drug has to be used. Usually, any hearing problem will only be caused by exceeding the recommended dosage of the medications. Audiological assessment should be done before and after ototoxic drug administration. The regular audiological follow-up should be done every 6 months in workers prone to deafness due to noise exposure, chemical toxicity. Workers of potentially ototoxic trade and chemical industry must be cautioned of the risk of deafness. Permanent hearing loss patients should be rehabilitated with hearing aids, change in lifestyle, and rehabilitation with yoga. Bath AP, Walsh RM, Bance ML, Rutka JA. 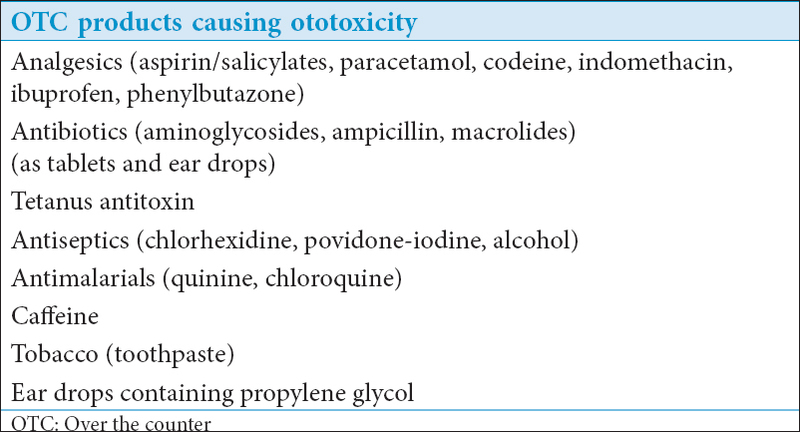 Ototoxicity of topical gentamicin preparations. Laryngoscope 1999;109:1088-93. Dobie RA, Black FO, Pezsnecker SC, Stallings VL. Hearing loss in patients with vestibulotoxic reactions to gentamicin therapy. Arch Otolaryngol Head Neck Surg 2006;132:253-7. Iwanaga T, Tanaka F, Tsukasaki N, Terakado M, Kaieda S, Takasaki K, et al. Does topical application of 5-fluorouracil ointment influence inner ear function? Otolaryngol Head Neck Surg 2006;134:961-5. McGhan LJ, Merchant SN. Erythromycin ototoxicity. Otol Neurotol 2003;24:701-2. Pappas S, Nikolopoulos TP, Korres S, Papacharalampous G, Tzangarulakis A, Ferekidis E. Topical antibiotic ear drops: Are they safe? Int J Clin Pract 2006;60:1115-9. Taneja MK. Role of ENT Surgeons in the national programme for prevention and control of deafness. Indian J Otol 2012;18:119-21. Taneja MK. Deafness, a social stigma, physicians perspective. Indian J Otolaryngol Head Neck Surg 2014;66:353-8. Rangasayee R, Bantwal AR. Ototoxicity. In: Kirtane MV, Brackmann D, Borkar DM, de Souza C, editors. Comprehensive Textbook of Otology. Mumbai: Bhalani; 2010. p. 381-97. Mukherjee DK. Chloroquine ototoxicity - A reversible phenomenon? J Laryngol Otol 1979;93:809-15. Park K. The utility of acoustic reflex threshold and other conventional audiological tests for monitoring cisplatin ototoxicity in the pediatric population. Ear Hear 1996;17:7-15. Taneja MK, Taneja V. Vitamin D. Deficiency in E.N.T. Patients Indian J Otolaryngol Head Neck Surg 2013;65:57-60. Blakley BW, Schilling H. Deafness associated with acetaminophen and codeine abuse. J Otolaryngol Head Neck Surg 2008;37:507-9. Kalinec GM, Thein P, Parsa A, Yorgason J, Luxford W, Urrutia R, et al. Acetaminophen and NAPQI are toxic to auditory cells via oxidative and endoplasmic reticulum stress-dependent pathways. Hear Res 2014;313:26-37.